I read this article and found it very interesting, thought it might be something for you. The article is called The Guru’s Big Five Questions – Tulia Lopes and is located at https://www.presentation-guru.com/the-gurus-big-five-questions-tulia-lopes/. 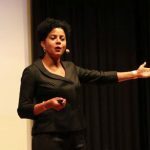 Tulia Lopes is a certified international speaker and award winning speaker at European level, and she speaks in several different platforms throughout Europe on topics like communication, leadership, women’s impact and empowerment. In 2014 she founded the AWE Summit event to give voice to women. In November 2017 she launched the Speak Up & Lead Academy to support women to develop a confident presence and strong voice in any platform they step in. Let’s not say it is the greatest speech in history. I will rather say that it is an excellent speech, well crafted and, above all, with a message which needs to be told over and over again if we really want to start improving our behaviour against discrimination, biases and intolerance, to name a few. It is the speech called “The danger of a single story” by Chimamanda Ngozi Adichie. In her speech she engages the audience in several different stories, her own stories, and tells them how the stories we hear and read shape who we believe we are, and who we believe others are; how each story becomes part of us, and we become part of the story; how we play many different characters while living our stories; how each character is part of us and we part of each of it. As a result, all parts unite, we become who we are. She “warns” us how seeing a person from one’s focal lens, does not define who that person really is. Therefore, we should be aware, and avoid, the danger of a single story. Many will agree with me that Steve Jobs was one of the masters of memorable presentations of our time. Why? Because he knew the power of storytelling. He knew that to ‘sell any idea’ we need to engage emotionally with our audience because we as human beings are wired to love stories. Storytelling is the currency of human contact. Without the emotional attachment of a story, an idea will fall on deaf ears. Who’s the best political / cause orator today and why? I will use a different superlative. Instead of the best, I believe we have many great people out there who are making an impact and moving people into action through their message and their stories. How powerful and great they are depends on the context and the audience. Therefore, I’ll refrain to say the best and instead, I’ll share the ones who made an impact in my own life and in the lives of many. For being a woman on a mission to help other women to find, own and unleash their authentic voices, Oprah Winfrey is a role model for me, and someone I follow closely. I believe that an introduction is unnecessary, right? The same applies to Michele Obama who uses her visibility and influence as former first lady to spread a clear message against inequalities at several different levels, and engages women all over the globe to take action. Know your audience: their demographics, their needs, their expectations, and above all, the language they communicate in. Because that is the language you will have to use in your presentation, or talk. Without knowing your audience, without communicating in a language they can connect to and understand, your message will land nowhere. You can have brilliant ideas, but if you don’t get your message across, your ideas will take you nowhere. Who inspired you when starting out in the business? Who inspires you now? More than “who”, I would say “what, why and how”. My academic background is architecture. And throughout my training, what fascinated me most was the ability that some architects have to bring rhythm to their buildings. Those rhythms would take us to experience different emotions; as in music. If you compare both fields, architecture and music, you will identify that both share several identical terminologies and techniques to express themselves, such as rhythm, harmony, structure, compass, tempo, pauses, etc. To me, architecture and music take people on an emotional trip, and so does a great speech. I started speaking in public in 2009, and I was immediately fascinated by the ‘power of words’. How placing a word in a different place; giving it a different emphasis; using it after a shorter or longer pause, could affect the meaning of a message, and its effect on the audience’s emotional state. “Words can make you laugh or cry, heal or wound, they can change the way you think and feel”, Billy Cox American bassist once said. It is the ‘feel’ that fascinates me most. Speakers who have the ability, as in music and architecture, to take you on an emotional journey; where such a journey has the power to change the status quo, heal others and move people to action – that is what inspires me. Through my voice, through my story, to be able to help others to find theirs. And through their voices to help them make a positive impact in their communities. In 2010 I started giving training in presence, presentations and public speaking. Since 2011 I have focused my work towards unleashing women’s voices – helping them to boost their confidence, raise their profile, increase their influence, income and impact by finding, owning and unleashing their authentic voice. Who inspires me now? People in general. The stories behind each person, and the impact they can make in this world is what motivated and inspired me to start this business and grow with it. Through my work I’m committed to bringing diversity to the stages worldwide. And the magic is already happening as of this year, together with women in Asia, Europe, and USA, I am co-launching a platform to bring more visibility and speaking opportunities to women in Europe and globally. Tulia Lopes is Europe’s leading communication, public speaking & leadership expert for women who want to Speak Up, Stand Out & Lead! She believes communication is the key to develop and excel in any field in life. Tulia is the author of Leading in High Heels, a step-by-step guidebook to help women assess their leadership skills and find the techniques to improve further. She is a certified international speaker and award winning speaker at European level and she speaks in several different platforms throughout Europe on topic like communication, leadership, women's impact and empowerment.